1. Wash the rice, poha, dal and fenugreek in water and soak them for 1 to 2 hours with the curd. 2. Grind to a smooth batter and mix well with salt. 4. Pour a ladleful of the batter and spread to make a thick dosa. 5. Apply oil around the edges and cover with a lid. 6. Remove when light golden. 7. 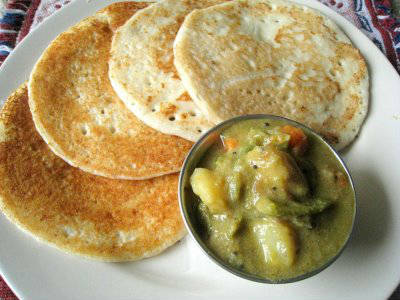 Serve 2 dosas per plate with kurma or chutney. Note: This dosa should be thicker than the regular dosa. Feel free to comment or share your thoughts on this Set Dosa Recipe from Awesome Cuisine.